Diabetes Australia has welcomed the start of the eftpos Giveback campaign, which will result in a donation of up to $2 million to support diabetes and cancer programs. This follows a strong public vote in an online poll for disease prevention, management and medical research as the preferred cause to be supported. 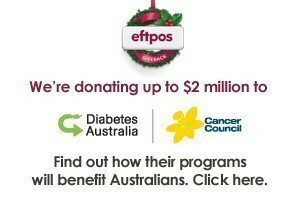 Diabetes Australia was selected alongside Cancer Council to be a recipient of eftpos’ Giveback campaign for 2013 based on an online poll showing strong community support for their causes. Diabetes Australia CEO Professor Greg Johnson said he was delighted with the donation of up to $1 million for diabetes programs. “The eftpos Giveback funds will help Diabetes Australia to develop a revolutionary online platform and awareness campaigns. People will be able to connect to diabetes prevention and management information and to other people, programs and services in new and powerful ways. They can be inspired, they can be connected, and they can take control of their diabetes and their health no matter where they are,” Professor Johnson said. “Diabetes is a serious epidemic and threatens the health and productivity of millions of Australians. We still see far too many complications – heart attacks, strokes, blindness, kidney failure, amputations – and much of this is preventable. We don’t get government funding to do this sort of work and this large eftpos Giveback donation is very important in supporting our work. We hope more major companies will get on board to help us reduce the impact of the diabetes epidemic in Australia,” he said. Diabetes is the fastest growing chronic condition in Australia. More than 1.5 million Australians have diabetes, with 280 people developing diabetes every day. eftpos CEO Bruce Mansfield said that during this year’s Giveback campaign, Australians would be asked to get actively involved on social media to raise awareness about skin cancer and diabetes. The Giveback donation will fund the Cancer Council’s Shade for Secondary Schools Grant Program which is set to launch in 2014. Secondary schools around Australia will be invited to submit an application to Cancer Council for a shade grant of up to $25,000. The grant will allow the selected schools to purchase permanent or temporary shade for their school. The grants will be divided proportionally across the nation based on state and territory school populations. Stephanie Rice, Australian Olympian and Cancer Council ambassador, has also welcomed the initiative.